Preheat oven to 425oF (218 C). Brush sourdough slices with olive oil. Bake at 425oF (218 C) for about 10 minutes, until toasted. Remove from the oven and set aside. Heat the olive oil in the skillet over medium heat. Add the onions and sauté until translucent. Add the garlic and sauté for about 30 seconds longer. Add the chopped mushrooms and cook for 3-5 minutes until the mushrooms are tender. Add the fresh oregano and remove from the heat. Add the crème fraiche and stir well. Add salt and pepper to taste. Let cool for about 5 minutes. 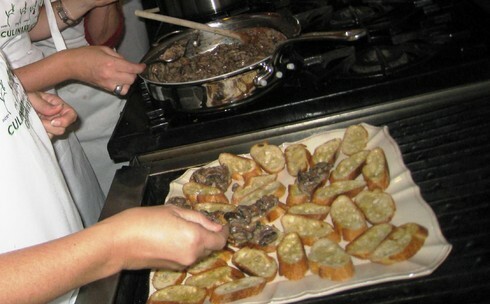 Spread the mushroom mixture on the toast and garnish with a sprig of oregano.